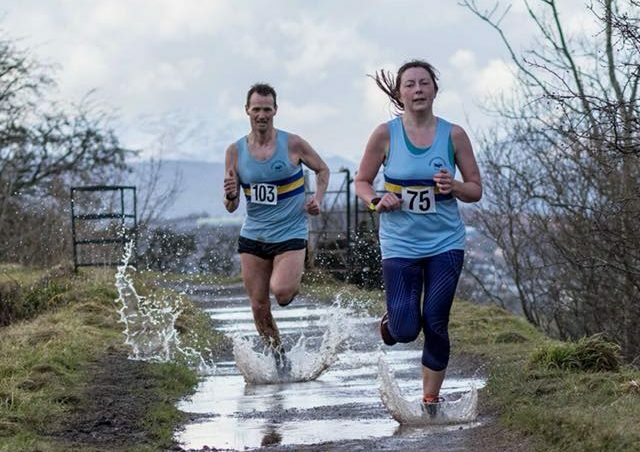 17 Harriers made it to the starting gates at Hamilton Park Racecourse on Sunday for the West District Short Course Relays. 2 mens teams and 3 ladies teams competed over the 20 furlong course which took them up and down the finishing stretch of the raecourse. The going was certainly heavy in places. The ladies vets team of Marian Monk, Lorna Coyle and Marianne McKay were 5th overall vets team, a great performance from them. The other two ladies teams competed well with a particularly strong run from Lisa Ruddy in the A team. Lorna Coyle’s time in the vets team landed her 2nd v55! Our top male team were hit by a late non runner and Paul Beaton was elevated into the A Team on the day. Paul put in a really strong run in the tough anchor leg to ensure a good finish for the team. Stephen Trainer had led the team out with a great run in 8th overall spot for the first leg. The star performer in the B team was Frank McMahon taking home first m65 in 19.05! Some found it tougher than others on the soft grass at Hamilton, but everyone will feel the benefit of it as the cross country season gets into full swing. Next up, Renfrewshire short course relays at Pollock Park next Sunday! This entry was posted in Uncategorized on October 16, 2017 by greenockglenparkharriers.